Are you planning a trip to Akagera National Park? Do you have an itch to go to the Eastern Province of Rwanda but don’t know much about this side of the country? We’ve got you covered. You can plan your whole next trip with confidence and discover hidden gems in Rwanda in this blog post! First and foremost… coffee breaks! 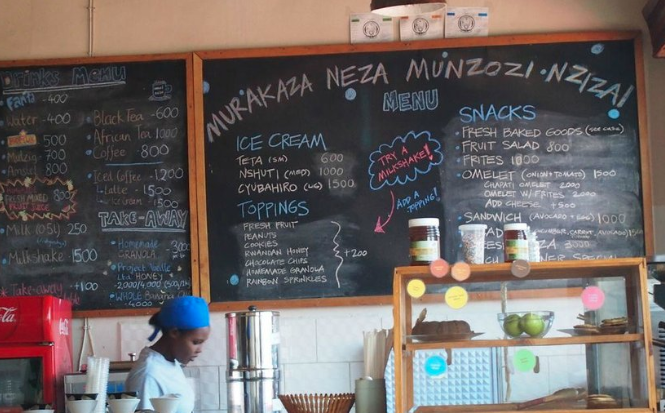 There are two social businesses that sell coffee to give you a boost of energy on the drive to Akagera. The first stop is the Imigongo Arts Center in Kayonza. Their mission is to innovate Imigongo art-making as a way add to the efforts of creating jobs for the youth and women in rural Rwanda. You can stop by for coffee and lemon muffins, or stay a little longer and take the Imigongo experience class and learn how to make a local art with talented Rwandans! Next up on the road to Akagera is the Urugo Women’s Opportunity Center, a local favorite! The center was built to provide a safe environment and dedicate facilities where women could learn, build new skills, and operate businesses that directly contribute to the local communities. Their cafe is on the main road and they sell homemade organic yogurt and delicious coffee. Next door they have a store with artisanal goods made by the women at the center. If you are looking for a place to stop for awhile, they also have a wonderful eco-lodge and offer unique cultural experiences such as craft demonstrations, farm tours, town tours, and a coffee trail tour. They even have a gathering space for events and a restaurant in the back overlooking the rolling hills. We highly recommend stopping here and spending some time with these incredible women! If you are looking to stay inside the game park here are two great options: Ruzizi Tented Lodge and Akagera Game Lodge. You can also set up camp at three different campsites throughout the park. Check out these gorgeous views on your next weekend trip! Safe journey on your travels and enjoy all the goodies on the way to Akagera! Located just 100 kilometers outside of Kigali, Butare is one of the best places to for your next weekend or day trip. As the second largest city and influential cultural center, everyone in your family will find something they love. Check out how we spend a day in Butare. Breakfast at Nehemiah’s Best Coffee! An early morning calls for some hot coffee and delicious food as well. Nehemiah’s Best serves up omelettes, fresh smoothies, pastries, and fresh coffee straight from Huye Mountain Coffee. It’s the perfect way to support local business and get energized for the day. Next, right down the road from Nehemiah’s Best is Our Lady of Wisdom Cathedral. This cathedral was built in the 1930s and is a stunning and simple example of colonial style architecture. If you aren’t awed the architecture, the size is sure to wow you. This cathedral is the largest in Rwanda, and one of the larget in all of central Africa. Take 30 minutes to explore its beautiful grounds and spend some time reflecting in its sanctuary. Time to use up some of that energy from breakfast! The Huye Mountain Coffee tour takes you on a beautiful hike up Mount Huye while teaching you about the different steps in the coffee roasting process. The tour starts with a freshly brewed sample at the Huye Mountain Coffee plantation, just a 5 minute moto ride from the city center. Then, follow your guide who is affectionately called Mr. Coffee up Mount Huye as he tells you stories of Rwandan history and coffee facts. At times, the hike is a little steep so make sure to wear comfortable walking shoes! And at the top, you’ll be rewarded by a beautiful 360 degree view and opportunity to roast your own coffee in the traditional way. The tour takes about 3-5 hours and costs 5,000 RWF for Rwanda citizens, and 21,000-26,000 RWF for travelers. Don’t have time to do the full tour? You can opt to do a shorter and cheaper 1 hour tour! Check out these photos from their website! I scream, you scream, we all scream for ice cream! After hiking up Mount Huye, it is definitely time to treat yourself! Inzozi Nziza is often called the best ice cream by anyone who has tried its sweet soft serve that is often topped with fresh fruit. Not only is it delicious, but also it is completely run by local women who are passionate about empowering their community! A true sweet treat! Finish out the day with a walk around the Arboretum, surrounding the University of Rwanda. The Arboretum features 178 species of trees and countless opportunities to catch sight of gazelles, monkeys, birds, and insects! As a part of the Queen’s Commonwealth Canopy, it has become one of the main centers of conservation and research in Rwanda. Finish out your day in Butare with a delicious family dinner! Here are a couple of our favorite places to relax with the family. Hotel Ibis- a vintage hotel on the main street of Butare that has been turned into a wonderful restaurant! Many people rave about their croque monsieur or chicken with peanut sauce! Amafu Ye Huye- Got lots of hungry kids? Take them to the buffet at Amafu Ye Huye! With a wide variety of options, it is sure to satisfy their stomachs without breaking your wallet. The Chinese Restaurant- Looking for something a little different? Grab some Chinese food at this casual family restaurant! Family Visit to the King's Palace in Nyzana Rwanda! In Rwanda’s southern province, Nyanza was once at the centre of Rwanda’s monarchy. Situated just a 2 hour drive from Kigali, a visit to the King’s Palace in Nyanza is the perfect day trip for families looking to escape the city. If you’re making the longer journey to Nyungwe National Park, a trip to Nyanza also makes for an interesting and easy stopping off point along your drive. Once meant to be the home of Rwanda’s King MUTARA III Rudahigwa, the Rwandan Ancient History Museum offers Rwandans and visitors a beautiful insight into the life of Rwanda’s former kings and the colonial era in Rwanda. Here you’ll also find a replica of the King’s Royal hut from the reign of King Musinga. It is a perfect entertaining and educational trip for your family! Photo posted by the Rwandan Government. While the museum and palace make for a great history lesson, the striking scenery and the King’s Inyambo cattle are really the star of the visit. These royal cattle are an impressive breed of horned cattle which have been trained to walk in a very elegant parade. From tip to tip, their horns can be 2.5 meters long! Family photos with the Royal Cattle from our trip to the King's Palace! Tips for Your Family's Visit! Families usually spend around 2 hours here! If you keep your ticket, you get 30% discount to National Arts Gallery -Rwesero which is just down the road! The National Art Gallery. Photo by Trip Advisor. You can’t wear shoes into the homes, so you should plan on wearing sandals that you can easily slip off. There is a gift shop and restaurant on the museum property. Both are well priced. The restaurant serves a variety of burgers, sandwiches, salads, pizzas, and other full meals. Local restaurants in Nzyanza include Haji Enterprise located just off of route RN1 about an 8 min drive from the museum. It good to get food on the road for your trip back! Dayenu Hotel, Nyzana Heritage Hotel and Quality Inn Motel also both serve good food in Nzyanza are only a few minutes away from the museum! The restaurant at Nyanza Heritage Hotel! A great spot for the entire family. Photo by Trip Advisor. We hope you enjoy your trip as much as we did! Share your trip photos with us on Instagram and Facebook (@kigalimomsanddads)! Rwanda's National Parks: Eco-Friendly Summer Family Trips! One of the Big Five Animals in Akagera National Park. Photo from National Geographic Society. Welcome to Plastic Free July! This month we are taking extra time to celebrate the earth's beauty! It is so important that we each do our part to protect it. Throughout this month, Kigali Moms and Dads will be sharing our best tips on small daily lifestyle changes that will reduce our carbon footprint and places to take our feet and explore beautiful Rwanda! Bring reusable water bottles and pack any snacks you can in tupperware instead of plastic. If you do have to bring in plastic wrapped snacks, make sure you take all the trash out of the park with you! Looking for ways to pack snacks, Bee’s Wrap are reusable snack wraps- easy, cleanable, and light! Leave the wilderness (including rocks, flowers, etc.) for everyone else to join aka in the park! Taking things out of the park may disrupt the ecosystem. Stick to the path! Though it may seem exciting to go out and explore, walking on ground that isn’t used to it may cause erosion or damage to several species. Wondering what to do in national parks? These symbols will help you navigate what’s available at each park! Hiking! Birdwatching! Primates! Hotels! Lakes! Caves! Gorilla trekking- Usually an early start, so be prepared for an early departure from Kigali! You can also come prepared with your gorilla tracking permit! Permits range from $75-$750. Learn how to get one here. Book your tour here! Musanze Caves- a two mile kilometer trail deep under the earth! Catch glimpses of bats, unique rock formations, and much more! Buhanga EcoPark- Mix conservation and history by touring this amazing site full of unique butterflies and birds. It was once the site of rituals performed by Rwandan Kings. Visiting Dian Fossey- Dian Fossey was an American conversationalist who dedicated her life studying mountain gorillas and advocating for the earth. Visit her grave or learn about her legacy through the many eco friendly businesses and groups such as the Dian Fossey Gorilla Fund in the Musanze villages or the Iby’iwacu Cultural Village. Email to reserve a tour of the activities above! Hiker at Parc Nationals des Volcans. Photo from Lily Crandall. Akagera is one the oldest parks in the region and known for its rich conservation history! It is home to of the first rescue missions of black rhinos in history of the world’s conservation parks. Now it is home to all of the Big 5 animals: lions, leopards, elephants, rhinos, and buffalo as well as many more unique and exciting species! Game Drive- Take a guided tour by foot or by car and see some of the big five animals up close! Available both during the day and at night! Bird Watching- Over 750 species of birds call Akagera National Park home! Nature Walks- Peaceful and slow walks around many of Akagera paths. Great activity for families with young children or want to have a relaxing day. The Walk the Line hike allows you to walk in daily routine of some of the parks staff members and learn more about the reintroduction of lions! Boat Ride on Lake Ihema- Enjoy a relaxing boat ride while seeing one of the biggest concentrations of hippos in East Africa along with many spectacular birds and views of elephants! Entrance fee- EA Nationals: $7 per adult/ $3.5 per child. Prices may change based on your residency status. Canopy Walk-Hang with the birds above the trees on the Canopy Walk. In two 2 hours, you’ll be able to discover the biology of underneath and above the canopy as well as see some of the most beautiful waterfalls of the region, the Ishuno waterfalls! Check out the trip itinerary of a family who loves Nyungwe Park! Gishwati-Mukura National Park is officially Rwanda’s fourth national park since 2015! It has had one of the biggest role in Rwanda’s focus on on improving biodiversity conservation! With its location on the Congo-Nile River Divide, there is a never ending supply of beautiful views! Chimp and primate trekking- Follow in the footsteps of primates! Remember you’ll still need a permit beforehand! Nature walks- Some of the most popular trails includes the Riverside trail, the Rushubi Tea Trial, and the Rucanzogera Trail! Activities range from $10-$35 per person. Views in Gishwati-Mukura National Park. Photo from Gishwati-Mukura. Want to travel around a National Park with a tour? 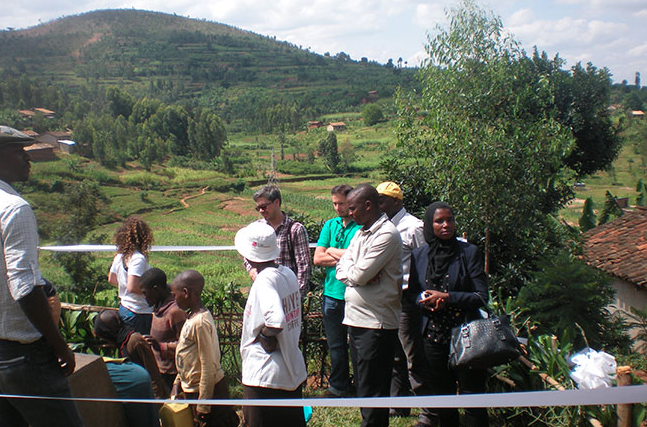 Check out Rwanda Eco-Tours! A road trip is one of the best ways for a family or group to explore the beauty of Rwanda. Get out of Kigali to enjoy more of Rwanda's sites and iconic hillsides. Want to plan your own trip without the use of a tour company or driver? These rental car companies in Rwanda will help get you out on the road! Know a company that should be added to the list? E-mail us or include it in the comments below! Rwanda is so small it's possible to get reasonably far out of Kigali for a day trip with your family. Here are three great day trips that can be tailored to immerse your children in nature and/or history. Huye (previously Butare) is only a two-hour drive from Kigali along good tarred roads. Whilst the town itself is interesting to explore, the most prominent tourist attract is the national Ethnographic Museum of Rwanda. The museum lies on the northern outskirts of the town alongside Kigali Road, and houses collections of exhibits on Rwandan history and culture. The surrounding area of Huye also offers interesting cultural sites, including the huge Roman Catholic cathedral built in memory of Belgium's Princess Astrid, the Old Customs House in town, the University shop, the Centre Universitaire des Arts and, of course, the University of Rwanda that forms Huye's most important institution. If you leave early you can reach the little lakeside town of Karongi (formerly Kibuye) as a round trip from Kigali. Hailed as one of the most relaxing and romantic places in Rwanda, it has beaches, water sport facilities and local boat tours. You can visit Napoleon's island, home to a colony of bats, or visit the Bisesero Genocide Memorial with breathtaking views of the lake. This once hard to reach area is now super accessible due to the construction of an excellent surfaced road from Kigali to the Burundi border. The two main sites of interest, Nyabarongo Bridge and the Nyamata and Ntarama genocide memorials are easy to visit as a day trip from Kigali. The drive takes about 30 minutes in a self-driven car, or slightly longer in a mini-bus taxi. Nyabarongo Bridge is a new bridge offering superb views over the Nyabarongo River, Rwanda's longest river and a tributary of the Akagera. It is an excellent place to spot birds including the pink-backed pelican, common moorhen, African jacana, three types of weaver, march flycatcher and black-headed gonolek. The Catholic Church of Nyamata, the scene of a horrific massacre during the genocide, now displays the clothing and personal belongings of the 10,000 people murdered on the site and underground crypts hold their bodies as well as those who died elsewhere in Nyamata. Another genocide memorial at Ntarama, 1km away from Nyamata, is also the scene of a similar massacre. Only two and a half hours outside of Kigali, The Kings Palace is the very well preserved palace of past Kings of Rwanda. The house of the King from 1931-1959 is still intact and inside holds objects and stories of Rwanda's history. You can also find a museum and national art gallery in the local vicinity. Visiting the area is a great way to learn more about Rwandan history and culture, as well as taking in the surrounding views. If you are looking for a weekend getaway in Rwanda with your older teens and 20 somethings, Nyungwe Forest is the trip for you. Today, we bring you the itinerary of a Kigali family who recently gave the adventure a go. Thank you to Dan, and his parents John and Pam, for sharing their trip with us. If you enjoy exploring beautiful scenery and incredible wildlife on foot with your family, Nyungwe is an enticing part of Rwanda that shouldn't be missed. Nyungwe is located in southwestern Rwanda at the border with Burundi. The Nyungwe Forest National Park was established in 2004 and covers roughly 970 km squared of rainforest, bamboo, grassland, swamps and bogs. It is hailed as one of the best preserved montane rainforests in Central Africa. To reach it, we drove via Kibuye and along Lake Kivu. The road is tarmacked and smooth, offering great views across the lake. Once there, we spent out first afternoon exploring the local tea plantations. Nyungwe Forest is surrounded by tea plantations, as the temperate climate and fertile volcanic soil here are good for tea plant growth. Tea is one of Rwanda's largest exports, so it was great to look around the fields and see the farmers. The scenery is also great, with luscious green tea plants covering the rolling mountains into the horizon. On our second day, we went chimpanzee trekking in the forest. Chimpanzee trekking here is $80, but there is no time limit like the one-hour given to tourists who go mountain gorilla trekking. In Nyungwe forest, you can spend as much time with the chimpanzees as long as you can keep up with them. We started our trek at 7am, spending roughly 6 hours in the forest. While tracking chimpanzees, other primates can also be spotted. You may have the chance to spot the Colobus monkey, the Silver monkey, Golden monkey, Red-tailed monkey, Vervet monkey, Grey-tailed mangabey and the Olive baboon. There are also 275 bird species, 1068 plant species, 85 mammal species, 32 amphibian and 38 reptile species in the forest, so stay on the look out. On our third and last day, we did the Nyungwe canopy walk. This is a tree top walk 50 metres above the forest floor. We could see monkeys move at the top of the trees below and the birds flying above whilst also taking in the amazing view across the forest. The canopy walk is 90m long, but we also got a chance to see other species whilst on the forest trail to the canopy. On the way back to Kigali, it's worth going via Huye to stop by the Ethnographic Museum there. It is one of the six museums that make up the Institute of National Museums of Rwanda and houses one of Africa's finest ethnographic collections. The collections on display include historical, ethnographic, artistic and archaeological artefacts. A few months ago, we brought you Akagera's ambitious plans to become a big five safari park. Sarah Hall, Akagera's tourism and marketing manager, told us that re-introducing lions to the park was just the first stage in the attempt to make Akagera a sustainable Big Five safari park. Re-introducing black Rhino to the park is the next stage. In the 1970s, there were roughly fifty black Rhino present in Akagera. However, the park’s last black rhino was spotted in 2007, nearly 10 years ago. While Hall can’t unequivocally pin their extinction in the park on poaching, she acknowledges that it’s a potential culprit. Excitingly, Sarah's hopes of re-introducing Rhino to Akagera has been successful. In May, 10 black Rhino were brought to Akagera on an extraordinary journey from South Africa. Akagera is now a Big Five safari park, with lions, elephants, leopards, buffalos and rhino all sharing their home here. What does this mean for your family? Whilst Rhino will require you to take extra precautions in the park, this is definitely an exciting time to visit Akagera. Alongside the big five, Akagera is also home to giraffes, hippos, topi, waterbuck, antelope, elope and zebra, along with smaller herbivores such as duiker, oribi, bohor reedbuck, klipspringer, bushbuck and impala. Akagera is now the perfect chance to educate your family on local fauna and flora, as well as the importance of conservation. If you are thinking of visiting the park, make sure to take along binoculars, a camera and plenty of snacks. You can stay overnight in the campsites or, for something more luxury, at Ruzizi Tented Lodge, Karenge Bush Camp or Akagera Game Lodge. To find out more, visit the African Parks section on Akagera. Rwanda has many family holidays to offer. But if you are considering taking your family further afield this summer, here are 5 family friendly holiday destinations in Africa. Madagascar is often ignored as a great family holiday destination in Africa. This is such a shame, because Madagascar offers a completely unique holiday experience that can be found nowhere else in Africa. The eclectic mix of cultures, unique wildlife and stunning scenery that includes both highlands and white sandy beaches makes Madagascar the perfect place for you and your family this summer. If you don’t fancy flying, Queen Elizabeth National Park is just a short drive North of Rwanda. The park offers a large selection of wildlife, including Cape buffaloes, hippos, crocodiles, elephants, leopards, Congo lions and chimpanzees. There is also a variety of scenery on offer, including the Maramagambo Forest, the Kigezi and Kyambura Game Reserves along with famous volcanic features such as volcanic cones, craters and their lakes. 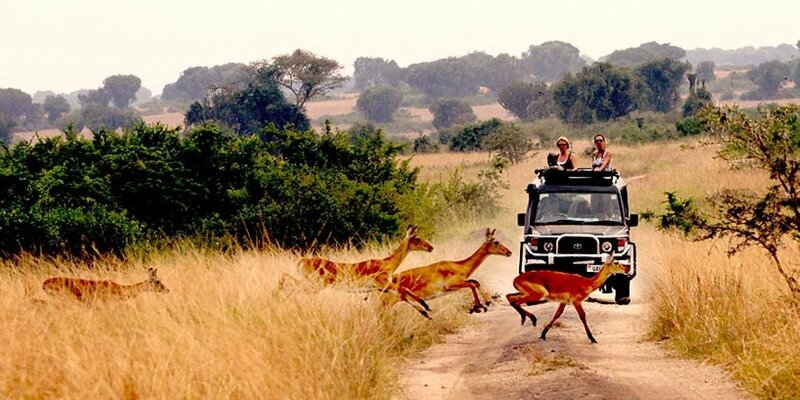 Queen Elizabeth National Park is an enticing adventure for you and your family. If you enjoy unspoiled nature, want to see African animals in the wild on one of the most affordable safaris in Africa and to take a glimpse in the traditional tribal life, then Namibia is the destination for you! Beautiful landscapes and rich wildlife are available to enjoy, but the real treasure of this country are its people. They simply give your visit a very special touch. It is one of the best places to visit with your kids. To find out more, check out our travel guide for Namibia. Accra is one of this years TOP holiday destinations worldwide. Accra is a metropolis with a backdrop of the birth of African Independence. Recently, it's also a growing arts hub and quickly becoming one of Africa’s cultural hotspots. It's got an easy going vibe, with friendly locals and established international communities. If your children are still young, Accra also offers you white sandy beaches to relax and play with your children. Close to home, this huge country fits in both safari holidays, city breaks and beach holidays. For beach holiday goers, Zanzibar and Mafia Islands are top destinations. For animal lovers, there is Serengeti National Park in the North, with 70 large mammal and 500 bird species. For active families, Mount Kilimanjaro and Ngorongoro Crater should not be missed. Tanzania offers excellent ways for you to relax with your family whilst also keeping your kids active and engaged with their surroundings. Planning summer travels with your family? Make your trip as smooth and as fun as possible for parents and children alike with these 10 travel tips. There's nothing worse than rushing, except maybe, rushing with toddlers in tow. Give yourself plenty of time to get to the airport, pack the car, or leave the house. Kids usually don't react well to time pressure during travel so everyone is more likely to stay calm and cool if you leave time for things like bathroom breaks, naps and tantrums. What visas do you need? Are your passports still valid? Are there any vaccinations required or recommended for your destination? Avoid last minute travel fiascos by planning ahead and doing plenty of research on your destination. Even if you're not leaving the country, you'll want to research stops for a long car ride and pack appropriately for the weather. While you're doing your pre-trip research, you'll want to plan activities that the whole family will love. It's important to keep your children entertained, but don't go overboard with planning every single minute of your trip. You'll want to be prepared, but flexible and keep in mind that often time, activities and travel take longer than expected when you're traveling with children. In addition to a list of activities at your destination, you'll want to plan a few games or activities that can keep kids entertained in case of delays at the airport or train station or a long traffic jam on the road. Traveling out of the country and into a new time zone? Parents and kids are susceptible to the woes of jet lag but there are a few ways you can help beat it and get some much needed rest. Stay active during your trip and step out into the sunlight. Resist the urge to spend your entire trip sleeping and try to adjust your mealtimes and sleep schedules to the new time zone. When your kids do sleep, try to do the same. Otherwise you may be up all day and all night when your kids give you a 2AM wake up call. While you should be able to find most medical essentials while traveling, it's much easier to carry around a small first aid kit with things like bandages, antihistamines, painkillers, or other medicines your family might need on your trip. This will save you time and stress knowing you have all your familiar medicines on hand just in case. Be sure to also pack any required medicines like prescriptions or antimalarials. Take lots of photographs and if your kids are old enough, encourage them to do the same! You can also give them a small travel journal to draw or write about things they see during your trip. It's also the perfect place to tuck mementos like ticket stubs or postcards. Make sure you have the numbers for emergency services on hand in case something should happen during your trip. Depending on your nationality, you may also want to register your overseas travel with the local embassy or consulate of the country you are traveling to. Another big safety reminder is to always travel with children in the proper car seats or booster seats. This may mean packing your own or renting one at your destination, but remember that dangerous car accidents can happen even at slow speeds and the perks of carrying less baggage are never worth the risks of a baby traveling without a car seat. You'll want to do the majority of the packing for your trip to make sure nothing important gets left behind and that everyone is dressed appropriately. However, involving kids in the packing stage can ensure they have a few items they'd like to keep themselves entertained during the trip and also helps get them excited about upcoming travels. Avoid hungry, grumpy kids. Pack your own snacks. This will save you stress during delays and in case your child is completely unwilling to try something new at meal time. You want to make sure that your kids have a great time, but don't forget about yourself! Stay calm, flexible, and remember that the journey is part of your adventure. Looking for a new adventure in Africa with the family? Today Ana Corel from Family Corel Adventures shares one of her favorite destinations to help you plan your trip to Namibia. If you enjoy unspoiled nature, want to see African animals in the wild on one of the most affordable safaris in Africa and to take a glimpse in the traditional tribal life, then Namibia is the destination for you! Beautiful landscapes and rich wildlife are available to enjoy, but the real treasure of this country are its people. They simply give your visit a very special touch. Is Namibia safe to travel with young kids? Definitely. As for every other family trip in a foreign country you need to do some preparation. In my quick travel guide to Namibia you can find some useful information, advice and travel tips to help you organize a trip to this amazing country. You can also check my Namibia itinerary to have an idea how much time we spent on a specific place. These are the best places to visit in Namibia with kids. If you are traveling solo, in a group or as a couple. Sossusvlei might be the most photographed place in Namibia. It’s definitely the most photographed desert in the world. This landscape is just so special - the red sand dunes are one of the tallest dunes in the world. When you pass Sossusvlei and the road turns into sandy path, there is a bizarre and very beautiful place, Deadvlei. From the end of sand path it takes half an hour walk to get to these salt pans between dunes with hundreds of years old tree skeletons, It’ so photogenic you should add it to your bucket list now! We stayed 2 days in the Sesriem Rest Camp. It's a great place to stay if you want to see the famous dunes of Sossusvlei at sunrise and not spend a fortune. The campsite is basic but well maintained. At night you can get visits of oryx and springboks during the day. Etosha is the largest game reserve in Namibia and the best thing about it is that you can see it from your own vehicle. You get a map of the park with the water holes where animals gather to drink and then you can explore the park by yourself. You can find all kind of African wildlife species, including some of the rarest ones like the endangered black rhino, the largest elephants in Africa and leopards. We stayed 2 days and camped in three main campsites in Etosha – Halali, Namutoni and Okaukuejo, depend of what part of the park we were visiting. Each camp has tourist facilities such as a restaurant, a shop, a motor garage for fuel and basic repairs. Spitzkoppe is a dramatic place with its granite peaks that rise from the dry flat plains, amazing views over the stunning landscape and caves with petroglyphs made by ancient San people (Bushmen) that lived in them. You can discover arches, natural pools and wander among the rock formations by day, and by night, there will be a million stars sky that you can observe above you. We stayed 2 days at Spitzkoppe campsites, very basic, but with stunning atmosphere and views and very easy to reach attractions. Kolmanskop is a ghost town in the heart of Namib desert. It was abandoned by its German inhabitants 60 years ago, when the diamond mine nearby ran out of diamonds. After that, nature did it’s job properly - broke the windows and the door frames and let the sand go inside. These incredible, once rich houses are now sunken into sand, and available for visitors to explore. We took a couple of hours to visit Kolmanskop and stayed in Luderitz at The Shark Island Rest Camp. The Camp has a great location, on the peninsula just by the ocean - we could watch dolphins playing around from our tent! Many visitors of Namibia just skip the southern part - we are not sure why, because it’s very interesting. There are huge private ranches that are typical for this part of the country. The vast, incredibly dry landscape and unbelievable views are all around. The roads that lead to the ranches are dusty, with mountains on both sides. You can spot oryx or ostriches running along the road. But once you reach the ranch, there is a green oasis waiting for you, with all kind of animals everywhere. We stayed 2 days at the lovely Ranch Koiimasis, a picturesque place placed among granite rocks on the edge of Namib desert. There were bunch of horses, guinea fowls, ostriches, geese and ducks between reception and our campsite. Cape Cross is home to one of the largest colony of seals in the world. It’s a protected area with over 100.00 seals, which makes a spectacular view. You can get very close to them and watch them hanging on the beach, swimming, barking, crawling into the sea, puppies playing. We spent a couple of hours here. On some ranches in Namibia visitors have the opportunity to interact with tamed animals that have their homes on ranches and farms. The scheduled cheetah feedings or game drives to view wild cheetah are the highlights of visiting. We spent 1 day at Quivertree Forest Rest Camp, a working farm just outside Keetmashoop. Near the camp are the Quivertree Forest and Giants Playground that are well worth a visit as well. Epupa Falls are situated on the border of Angola and Namibia, where Kunene river falls 35 m deep. The setting is spectacular. There is a viewpoint nearby at the Epupa Falls Lodge and Campsite where you can view the beauty of the falls and baobabs on the edge of the cliffs. Even if some people say that bathing in the natural pools of the river is OK, we were told that on this part of the river crocodiles kill around 30 people per year. We stayed 2 days at Epupa Falls Lodge and Campsite that has a great location among the tall palm trees on the banks of Kunene river and beautiful views over the falls from the restaurant. The upper reaches of the Okavango Delta are totally different than any other part of Namibia. There is a lot of water and vegetation everywhere. You can spot crocs and hippos and if you take a boat you can get a little bit close to them. In the dry season you can see also other big animals on the river banks. We stayed 2 days at Ngepi Camp, situated on the banks of Okavango river. It has amazing and award winning camping spots and fascinating outdoor toilets and showers. There is a crock pool too - a floating swimming pool in the river and the world’s first “croc and hippo cage dive”. There are many tribes in Namibia, each different than the other. Depending of the environment they live in, they have different ways of life, ways of dressing and hairstyles. We loved having authentic interaction with local people and tribal people of Namibia. They were great to talk to and it was great to see their everyday life. We visited villages of the San, Himba and Hakaone people. Those were the moments and experiences that we will never forget. We suggest to stay 2 days at a tribal village. It’s so different than spending only an hour - you get closerto the villagers. We visited the Himba tribes near Purros and near Epupa Falls. The Hakaone tribe we visited on our way from Epupa Falls to Opuvo. The San people we visited near Tsumkwe. SCOTT WILHELM, SECOND FROM RIGHT, WITH THREE RWANDAN ENTREPRENEURS WHO OFFER THEIR SERVICES ON VAYANDO. PHOTO: VAYANDO. The next time you go on holiday, as you pack your bathing suit for the white sandy beaches or boots to hike the mountain, how about making a difference in the community you visit? How? Simple. Vayando it! Vayando is a social enterprise with one thing on its mind: to provide tourists with a unique opportunity to explore indigenous cultures in developing countries and also support local micro-entrepreneurs. It’s pretty simple, you log on to the Vayando website, select your country of choice, read up on the location, select your micro-entrepreneur of choice and schedule your visit. Voila! Rwanda here we come! On the flip side, if you’re an entrepreneur in Rwanda, you can boost your income and showcase your business to interested visitors through Vayando’s platform. For instance, Poppin Chris offers hip hop and dubstep lessons. Grace teaches traditional basket weaving, and Yakubu educates travelers on the art of street photography. Vayando was founded in 2013 by Jason Seagle and Scott Wilhelm, friends who worked together in the Peace Corps in El Salvador. Their experiences meeting local micro-entrepreneurs and mixing with travelers passing through Central America planted the seed for Vayando. They quickly realized that their friends and acquaintances were willing to pay for immersive experiences in local communities. Vayando’s entrepreneurs earn an additional US$24 for each session they conduct with tourists, with an estimated two sessions a month. So, if five people want to learn how to cook a traditional Rwandese meal with Aminatha, for example, and make a booking, Aminatha will bring in US$120 in addition to her regular income. Vayando also earns revenue by charging tourists a separate booking fee. It’s a win-win. Three years on, Vayando is changing the lives and incomes of 40 microenterprises in Rwanda and Costa Rica. And they are not stopping there. In 2015, Vayando surpassed its Indiegogo crowd-funding goal of US$15,000 to keep the ball rolling. Ultimately, Vayando hopes to positively impact microenterprises in 100 countries across the developing world. We had a chat with co-founder and Chief Operating Officer Scott Wilhelm on their growth and expansion plan across Africa and the rest of the developing world. What made you pick Rwanda and Costa Rica for your pilot countries as opposed to El Salvador where you had volunteered in the Peace Corps? There were a few factors — who we knew at the time, where we wanted to reside, what the tourism market was like at the time, etc. We’ll eventually be in El Salvador — there are a lot of talented micro-entrepreneurs, and I look forward to visiting again. How long did it take you to set up shop in Rwanda? Setting up a business in Rwanda is remarkably easy. It’s also a small country, and everyone seems to know everyone else. We were able to get started very quickly. Once we found our entrepreneurs, it was just a matter of spreading the word about the product — that’s the hard part. Were there any difficulties in approaching your first set of micro-entrepreneurs? It was quite a painless process. Business owners and small-scale entrepreneurs must know a good deal when they see one. It doesn’t cost entrepreneurs anything to be on our platform, so there isn’t any risk associated with being a part of Vayando. What kind of vetting process do you use when seeking the ideal microenterprise? Many of our entrepreneurs are referred by trusted partner agencies. We identify folks that incorporate innovative approaches to income generation and will offer a direct tourism service to travelers. The important thing is that they are motivated and will maintain a professional, respectful relationship with travelers, Vayando, and our partners. How many visitors have you had over the past three years of operation? I’ll just say that our growth already in 2016 has been significant. We’re looking forward to the peak travel months. Which countries are these visitors mostly from? Mostly from the U.S. and Northern and Western Europe; we’re hoping to get more nationals of the countries in which we operate. You are targeting 100 countries; how many of those countries are in Africa? We’ll have a very big presence in Africa. I don’t have an exact number, but I’d say you can count on us eventually being in over 30 African countries. What made you choose crowd-sourcing over conventional grant seeking or venture capital injection for your operations? We have a strong network of friends and family who have always been really supportive. We figured by having perks made by small-scale entrepreneurs [as gifts in exchange for donations], the crowd-sourcing campaign would be a great way for folks to start engaging with the entrepreneurs we’d be featuring on the site. It was a real success, and contributors got some great perks. We’ve received some grants along the way as well, and we’re always looking to connect with the right social impact investor. What are some of the things that you wish you’d known when you were setting up shop? As a social enterprise with the potential to have significant impact on the lives of entrepreneurs and their families, we assumed we’d clean up in competitions, mentorship contests, etc., and have no problem landing seed money. We’ve done really well in everything we’ve applied to and are proud of what we’ve been able to do, but we haven’t taken the gold medal … yet. We’re finding that a lot of social impact competitions are focused on the newest composting toilet, solar lamp, or water filter. What makes your job super exciting every waking day? It’s really an honor to meet so many talented entrepreneurs and hear them react well to what we’re doing. I also get to meet travelers from all over the world and, hopefully, help make their travels great. I really enjoy connecting people who might otherwise not have met. I love reading blogs written by travelers who enjoyed their Vayando experience, or seeing pictures online, or hearing that entrepreneurs still communicate with travelers they’re had visit them. ONE OF FIVE LIONESSES RELOCATED FROM SOUTH AFRICA TO AKAGERA NATIONAL PARK. PHOTO: MATTHEW POOLE/RDB FLIKR. Just a short drive from Kigali, Akagera National Park is a thriving spot for visitors, expats, and locals alike and a great option for families looking for a nearby getaway. Akagera’s tourism and marketing manager, Sarah Hall, shares why Akagera is worth a family visit! In June 2015, Akagera National Park welcomed seven lions from South Africa — the first to roam the park in 15 years. The lions are now thriving, and three cubs, born earlier this year, delighted audiences worldwide in photos posted on the park’s Facebook page. The lions brought with them a surge of interest and tourism. Since the introduction of the predators, the park has seen a 40% increase in domestic tourism and a 23% increase in overall park visitors. But for African Parks, the nonprofit that jointly manages Akagera with the Rwanda Development Board (RDB), the lions are just the first stage in a series of improvements to position Akagera as a self-sustaining Big Five safari park. Since African Parks partnered with RDB in 2010, the number of park visitors has more than doubled, from 15,000 in 2010 to 32,000 last year. While many tourists make the day trip from Kigali, on-site accommodations offer another potential tourism draw. The opening of Ruzizi Tented Lodge in November 2012 provided the park’s first luxury accommodations. Now, the park is hoping to attract even more visitors with a five-star lodge on Akagera’s northern edge. African Parks is currently working on finding a hotel management company to run and develop the lodge. The ultimate aim of these improvements is make Akagera self sustainable. Last year, the park’s revenue totaled US$1.2 million to meet a US$2.2 million budget — a US$1 million shortfall. Donor money from a variety of private and government sources filled the gap. But Hall says the park’s long-term goal is to wean itself off of donor funds and rely solely on revenue. The addition of new animals and a five-star property will no doubt help in reaching that goal. Hall is optimistic that the park can increase tourism revenues in Rwanda as a whole too. The tourism industry is the country’s largest foreign exchange earner, pulling in some US$318 million in revenue last year. A Big Five park is expected to boost those numbers by attracting tourists who previously traveled to neighboring countries for the full safari experience. Beyond its financial impact, Hall says the park plays an important role in the preservation of African wildlife, particularly elephants and lions — and soon the black rhino. African Parks also educates the surrounding communities on the importance of conservation, she says. Some of those community members likely remember a time when the park teemed with wildlife. Hall hopes to return the park to its former glory. “Ecologically speaking, it would be great for the park to have all those animals it once had back again,” she says. Rwanda may be commonly known for gorilla treks when it comes to tourism, but the country has a lot more to offer. Rubavu District is a prime example. As the locale for Rwanda’s best beaches and lakeside resorts, the district’s reputation is growing among local families and foreign visitors alike. A New Times journalist recently visited Rubavu as part of a media tour to promote domestic tourism and ticked off some of his favorite attractions. “What’s so great about them?” you ask. We dug around to find out. This diverse and beautiful nature trail stretches along Lake Kivu and runs from Rubavu through Rutsiro, Karongi, and Nyamasheke to Rusizi District. You can hike, bike, or drive the 227-kilometer trail. Hiking the full stretch takes 10 days. The Rwanda Development Board provides a free trail map with information such as hiking conditions, local attractions, and camping sites. This is the perfect spot for tea lovers as visitors get a guided tour of the plantation. They also learn the manufacturing process that transforms green tea leaves into a product that’s ready for packaging and shipping throughout East Africa and abroad. This is the newest national park in Rwanda, and park officials are creating more hiking trails for visitors to see a wide variety of primates, including chimpanzees, the black and white colobus monkeys, l’hoest monkeys (also known as mountain monkeys), blue monkeys, and golden monkeys. No visitor reviews yet, but you can bet they’ll be flooding in soon. Rubavu offers a variety of mountain hiking activities that appeal not only to the fittest hikers, but also the casual walkers. On Mount Rubavu, you can participate in a brief hike that will reward you with a stunning view of Gisenyi, the capital of Rubavu District. For a more challenging hike, make your way up Mount Muhungwe, the highest non-volcanic peak in Rubavu. The seven-hour journey winds through mountain villages and provides panoramic views. If that sounds too easy, then consider a two-day hike up Mount Karisimbi, the highest peak in the Virunga Mountains. Apart from hiking and biking, adventure seekers can also participate in water sports on Lake Kivu. Kayaking and swimming are among the most popular as the water is calm and crocodile free. Or you can simply sit on the shore and watch the fishing boats come in at sunset.